The 9 Best BBQ Joints in Rhode Island! From your classic pulled pork sandwiches to Chinese barbecue, you’ll be surprised to find that Rhode Island offers its own exemplary barbecue joints. Head to the market, grab a quick bite from a barbecue truck, or sit down at one of these mom-and-pop style locations and chow down on some of the best barbecue you’ll find in the Ocean State! Take a break from the Newport seafood scene and grab some delicious barbecue. Binge cooks all of their hormone-free meats daily in a wood-fired smoker. 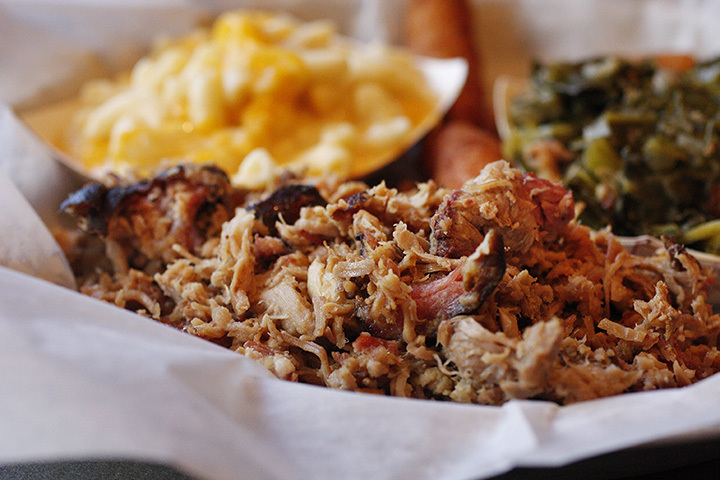 For just $15, pick your choice of two meats and two sides with a biscuit. Sides include coleslaw, baked beans, creamed Brussels sprouts and fried potato wedges! And the best part? Binge is open on weekends until 2 a.m.! Yes, it’s possible—you can get good barbecue this far north! Meat lovers can find salvation at Eddie’s food truck. Their specialties include pulled pork and ribs. Vegetarians can also rest easy, as there are options for you, too, including a rich and creamy mac and cheese, grilled chesses, and a butternut squash hash. Durk’s arrived on the Thayer scene this spring, cooking up incredible smoked meats. You’ll want to try it all—those crispy kimchi-style brussel sprouts, the creamy mac and cheese, the perfectly sweet corn bread. And best of all are the meats: slow-cooked brisket, ribs, and pulled pork. You can’t go wrong! GottaQ began as a food truck and quickly evolved into a restaurant as demand outgrew the four-wheeled smokehouse. In addition to the meat, go for some sides. Their collard greens are some of the best around, and locals love the mac and cheese with barbecue chicken! With a cozy atmosphere, limited seating space, and flowered wallpaper inside of this vintage home, you’ll feel like you’re seated at the family dinner table when eating at Becky’s! The ribs perfectly fall off the bone, and you’ll die for the potato salad and cornbread. With locations in both Warren and Jamestown, Pink Big is smoking their meats across the state and around the clock. Pink Pig boasts that it slow-cooks their meat for 10-14 hours for true juicy and smoky quality. You’ll love all of the delicious sides, such as the fresh coleslaw and smoked corn on the cob! Barbecued ducks and chicken dangle from the ceilings of New Wing Kee. This hole-in-the-wall market offers entire roast ducks for $20, and also tasty and crispy roast pork. In a town without much Chinese barbecue, this spot is a lucky find! Located along the wharf in an open-air seating area, Smoke House is offers up some of the best meat in Newport. The dry rub on the ribs is perfectly smoky and flavorful. For a juicier bite, go for the wings, and top it all off with a great red sangria. After just one trip, you’ll agree that this barbecue truly is Food For the Soul. Even if you don’t feel like leaving your house for barbecue, just order in, as this restaurant delivers their incredible $7 dinners right to your door.